Hmwe Hmwe Kyu, MBBS, MPH, PhD, is an Assistant Professor of Health Metrics Sciences at the Institute for Health Metrics and Evaluation (IHME) at the University of Washington. In this role, she leads the modeling of tuberculosis for the institute’s landmark Global Burden of Disease study. Dr. Kyu’s research interests are in the areas of infectious disease epidemiology, child and adolescent health, systematic review methods, and multilevel modeling. Before joining IHME, she was a postdoctoral fellow at McMaster University and the Offord Centre for Child Studies in Hamilton, Canada, and was a recipient of a Lawson postdoctoral fellowship. Her doctoral and postdoctoral research focused on how individual and contextual factors (at the country, community, and household levels) influence childhood diseases and mortality, especially in low- and middle-income countries. 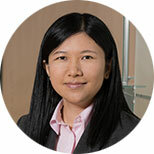 Dr. Kyu earned her medical degree from Institute of Medicine, Mandalay, Myanmar, her MPH from Chulalongkorn Univeristy in Bangkok, Thailand, and her PhD in Health Research Methodology from McMaster University in Canada. IHME was established at the Unviersity of Washington in Seattle in 2007. Its mission is to improve health through better health evidence. Kyu HH, Shannon HS, Georgiades K, Boyle MH. Association of urban slum residency with infant mortality and child stunting in low and middle income countries. BioMed Research International. 2013 Sep 17. Kyu HH, Shannon HS, Georgiades K, Boyle MH. Association of urban slum residency with infant mortality and child stunting in low and middle income countries. BioMed Research International. 2013; volume 2013, Article ID 604974. Kyu HH, Shannon HS, Georgiades K., Boyle MH. Cesarean Delivery and Neonatal Mortality Rates in 46 Low and Middle Income Countries: A Propensity Score Matching and Meta-analysis of Demographic and Health Surveys Data. International Journal of Epidemiology. 2013; 42(3):781-791. Kyu HH, Shannon HS, Georgiades K, Boyle MH. Caesarean delivery and neonatal mortality rates in 46 low- and middle-income countries: a propensity-score matching and meta-analysis of demographic and health survey data. International Journal of Epidemiology. 2013 June; 42(3). Kyu HH, Georgiades K, Shannon HS, Boyle MH. Evaluation of the association between long-lasting insecticidal nets mass distribution campaigns and child malaria in Nigeria. Malaria Journal. 2013; 12:14. Gonzalez A, Boyle MH, Kyu HH, Georgiades K, Duncan L, Macmillan HL. Childhood and family influences on depression, chronic physical conditions, and their comorbidity: Findings from the Ontario Child Health Study. Journal of Psychiatric Research. 2012; 46(11):1475-82. Shi Q, MacDermid JC, Santaguida PL, Kyu HH. Predictors of surgical outcomes following anterior transposition of ulnar nerve for cubital tunnel syndrome: a systematic review. The Journal of Hand Surgery. 2011; 36(12): 1996-2001. Lo BW, Kyu HH, Jichici D, Upton AM, Akl EA, Meade MO. Meta-analysis of randomized trials on first line and adjunctive levetiracetam. Canadian Journal of Neurological Sciences. 2011; 38(3):475-86. Corsi DJ, Kyu HH, Subramanian SV. Socioeconomic and geographic patterning of under- and overnutrition among women in Bangladesh. The Journal of Nutrition. 2011; 141(4):631-8. Kyu HH, Georgiades K, Boyle MH. Biofuel smoke and child anemia in 29 developing countries: A Multilevel Analysis. Annals of Epidemiology. 2010; 20 (11): 811-817. Kyu HH, Georgiades K, Boyle MH. Maternal smoking, biofuel smoke exposure and child height-for-age in seven developing countries. International Journal of Epidemiology. 2009; 38 (5): 1342-1350. Kyu HH, Fernandez E. Artemisinin derivatives versus quinine for cerebral malaria in African children: a systematic review. Bulletin of the World Health Organization. 2009; 87 (12): 896–904.